If I rapidly [CTRL]-RightArrow to skip a couple of images, the filename displays in the main window can get out of sync with each other after RD has stopped loading files (screengrab attached). If I then slowly do [CTRL]-RightArrow [CTRL]-LeftArrow the displays come back in sync. 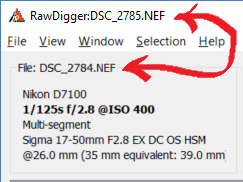 The EXIF window updates in asynchronous way and not updates if another exiftool process is already running for previous file. Can still reproduce - sorry. I can still reproduce the same problem with build 496 (Windows/x64), though it's much less likely. The usual behaviour with this build is to move forwards/backwards by one file, and then repeatedly reload that file. Looks very strange for me, because File: in information window title and 'window title' are set from the same source at the same time. Will look deeper into that, thank you for problem report. file, and then repeatedly reload that file. Could you please describe in more details. What you do to get this problem? Ctrl-left/right keys, drag/drop, anything else?